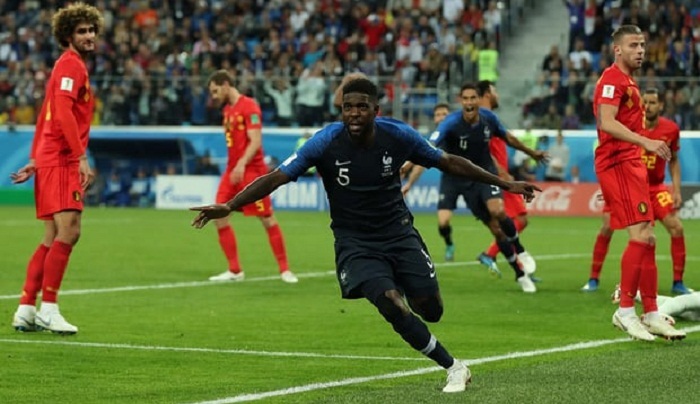 Samuel Umtiti headed France into the World Cup final in Saint Petersburg on Tuesday with a 1-0 win, consigning Belgium's 'golden generation' to another bitter disappointment. "Finals have to be won because we have still not got over the one we lost two years ago," said France coach Didier Deschamps. While France march onto Moscow, Belgium must dwell on defeat for another four days before the third-place playoff on Saturday. "We have to get rid of this feeling and finish on a high as that is nothing more than the players deserve, not to leave with a sour taste," added Martinez. "Disappointed, of course, you can't be anything else." Deschamps' men ended the opening period on top, but again Olivier Giroud looked short of confidence as the focal point of the French attack. Giroud has not scored in eight games and is yet to even have a shot on target in Russia. That was as close as Belgium came to taking the game to extra-time, though, as Lloris comfortably parried a long-range piledriver from Axel Witsel.